Michael Walsh is an American sculptor born in 1974 in Pittsburgh, PA. He has lived throughout North America and presently lives and works in Pittsburgh, PA. He is a catalyst, igniting a continual discourse on the history of metal sculpture and modern industrial and digital processes. As a pioneer of the graffiti sculpture movement, he has worked diligently over the past two decades to develop both his work and the movement’s forward trajectory. 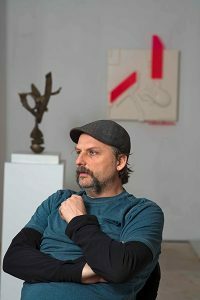 His work has been exhibited and published both nationally and internationally, selected examples include: The International Sculpture Conference 2016, Carnegie Museum 2016 (Pittsburgh PA); National Archaeological Museum 2014 (Florence IT), Burning Man 2012 (Black Rock City NV); and Art Gallery of Ontario (Toronto ON). His work is both part of private collections and on permanent public display. His work has been featured in Architectural Digest, MakeZine, The Toronto Star, Graffiti World (Nicholas Ganz), and in The History of American Graffiti (Gastman/Neelon). My practice is centered around the forward progression of my aesthetic. I am on the artists’ journey of discovery, the forever student. Self-study of art history, architecture, and design merge with my roots in graffiti art to create a unique visual language that can traverse from medium to medium. The vocabulary of this work is contour, form, process, innovation, and dynamic movement. Through a stream of conscious and unconscious decisions my inner dialogue renders finished works. Channeling music is intrinsic to the process; it acts as a catalyst connecting emotions and rhythms, transforming them into form and composition. By engaging in both tactile and digital mediums it is my goal to make the art of our time. Boulevard of the Allies and Forbes Avenue, Painted Collaborative Mixed Medium Mural Sponsored by the University of Pittsburgh, The United Way, and The Oakland Business Improvement District, as Part Of An Ongoing Urban Renewal Project.